After all the many years behind the road, when you invest in an oven, don't you think we should start baking? Utterly. Otherwise, it defeats the purpose of investing in a new kitchen equipment. Don't you think so? I reckon. All these while, I have been the over the stove portable grilling pan person (Grilled Fish In Banana Leaf & Grilled Salmon). So, oven investment seemingly has brought a broad smile on my face. Nevertheless, I must also say that we Malaysians, unless you are baking enthusiast, we generally prefer on fire under our pots and pans cooking. Anyway, I am not regretting. Never know, it may spiral me to start seriously baking? Early to throw words though and mind you, I have already started and here is the latest from my oven. Baked Cornflakes Chicken (Grilled Chicken Wings). Any part will do (Sesame Chicken & Sweet Chilli Chicken), of course, I love the sinful wings (Chicken Feet Kerabu/Salad), but remember, as far as I know, baking is healthier compared to frying (Fried Shrimp Wanton). Dried herbs I already had went into this baked cornflakes chicken, of course you have the liberty to to other herbs, fresh or dried. Crispy, yummy and mouth crunching pop-ohlalala Baked Cornflakes Chicken, paired alongside sweet potatoes, optional. Marinate wings with oil, garlic, oregano, basil, chilli flakes and salt for at least 2 hours. 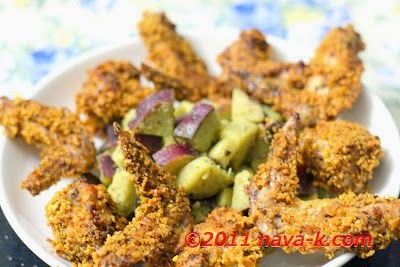 Thereafter, coat/roll each wing generously over corn flakes. Arrange on a non stick baking tray/pan. Bake at 180c for 40 mins or until wings are cooked, crispy brown coating atop. In a mixing bowl, combine and toss all the ingredients. something new and looks tasty too. These look lovely! 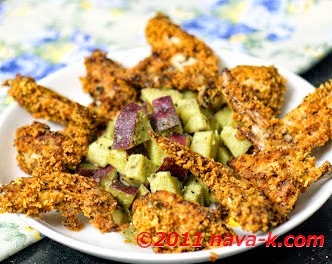 I've only ever tried a similar recipe with chicken breast, but my crumbs never stayed on as nicely as yours! The sweet potato side sounds great, too. Oh, your crispy wings sound so flavorful and delicious! I bet this mixture would be great on boneless, skinless breasts, too. Looks so crunchy and yummy! Nava these sound so delicious and healthy! 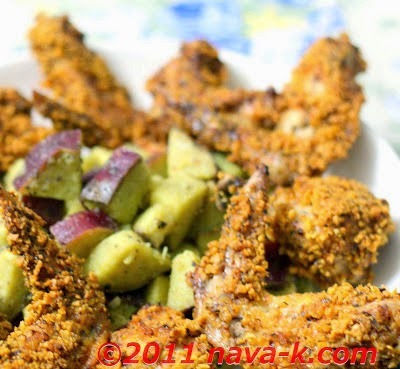 I LOVE chicken wings and you make some amazing recipes with them! Thanks! Nava as always you came out with your own creative idea and am very sure the taste damn good. mmm this is a do able recipe for me. Will try it out. crispy + crunchy = the perfect wings! a healthier way to do the chicken i think.. rich in fibre if i'm not mistaken.. This chicken looks crunchy and yummy!!! Love doing crispy chicken with cornflakes.